I don’t mind being over excited about Google wave, because I saw the google wave preview video. It’s worth being little over excited about. Being over excited includes trying to know how it will be useful for me, and my friends, so, for those who love google wave and wordpress, let me introduce you to two wave plugins for WordPress. update : Wanna try 8 more useful Google Wave Plugins ? The first Google wave plugin for WordPress that I noticed is WordPress Wave ShortCodes. Â As far as I could see, it was the only plugin that has active development going Â on. Adds a shortcode to WordPress that makes it easy to embed Wave(s) in a post or page. It also adds a media button so one is not required to remember how a shortcode is structured. That was from the plugin’s page on Google Code. So, it will help you add waves to your wordpress posts, with the use of short codes. To make it more simple, there will be a media button for this. You will have a media button just like you have one for adding image or video, on the wordpress dashboard, where you write new posts and pages. 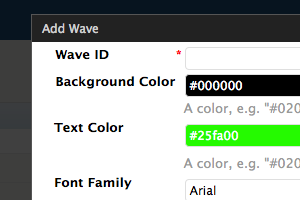 When you click on that, you will get a menu where you can enter wave ID for your wave that you want to insert, and then specify font and background color etc. Is there a Demo ?Â Can I try it ? Joshua French I don’t have much info about him. Sorry about that. The second Wave plugin for WordPress. I do not see much activity on this plugin’s homepage, but the idea is good. A Wave bot, based onÂ bloggy that posts to WordPress from the Wave client, a very basic one. I will keep you posted when there is something important here. So, that’s it. Now tell me how excited you are, about Wave, and using Wave for blogging, especially WordPress. And yea, for blogspot users, Google won’t forget you all when Wave is ready, and if you saw the developer preview video, there is a tool already being used by developers, so you are safe. Since it’s already on WordPress’ Official Plugin Directory, things will be easy. You can install it even from your wordpress dashboard. Next Tweetbacks : Steal your comments from Twitter ! Man you are so excited about this WordPress thing that it can get really infectious. I am on the verge of launching a few other blogs. And i think i would do it on WordPress. That is..if i have your support. I personally dont know much. About wordpress or anything else for that matter. anything for wordpress bro !! let me know what you need help with !! Implement the full embed api, an it will grow with all api changes. i hope you like it! I can’t wait for WordPress plugins that use Google Wave. It’s leading the way to real-time commenting and instant initial response from the blog or site owner. And hopefully the instant reponse will be useful and not just an Ad! Thanks for sharing !! I will check it out .. There has since been some work done by wavr and iframe embeds for getting google wave into wordpress plugins.